A 5.1 magnitude earthquake in Venezuela also rattled parts of Guyana Friday night, residents especially in Essequibo and North West District said. 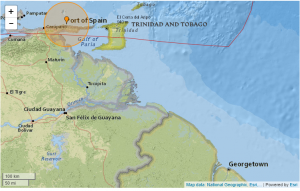 The quake occurred 22 kilometres, North North West of Irapa in Venezuela and also shook Trinidad heavily. The epicenter was located at 10.764°N 62.627°W and with a depth of 106.3 kilometres. “Felt the tremor about 9:55 Reliance Essequibo Coast,” said Nadeira Drikpaul. Other persons reported feeling the tremor in Matthews, Ridge, Kamarang and Baramita in the North West as well as Queenstown on the Essequibo Coast. There were no immediate reports of damage or injury in any of the affected areas.